Istanbul Full Day City Tour, Ottoman Splendours, The Imperial Tour, Topkapi Palace Tour, Hagia Sophia Tour, Blue Mosque Tour, Grand Bazaar Tour, Excursion Istanbul, Istanbul Sightseeing Tour, Tour Guide in istanbul, Sultanahmet Square, Historical tour of Istanbul, Rüstem Pasha Mosque. * Topkapi Palace (Topkapi Sarayi) was the imperial residence and administrative heart of the massive Ottoman Empire, beginnng with Fatih Sultan Mehmet the Conqueror, in 1453, until 1856. It was converted to a museum in 1924. Parts of the palace such as the Harem, Baghdad Pavilion, Revan Pavilion, Sofa Pavilion, and the Audience Chamber distinguish themselves with their architectural assets. The museum also has collections from the Imperial Treasury, as well as Chinese porcelain, weapons, calligraphy, etc. The Treasury also houses the Topkapi Dagger, the 86-carat "Spoon Maker's Diamond", and the jewel-encrusted bones of St. John the Baptist. * Yeni Cami (New Mosque ) originally named the Valide Sultan Mosque and later New Valide Sultan Mosque after its partial reconstruction and completion between1660 & 1665; is an Ottoman imperial mosque located in the Eminönü quarter of Istanbul.It is situated on the Golden Horn, at the southern end of the Galata Bridge, and is one of the famous architectural landmarks of Istanbul. After the tour, at approximately 5:00 pm, you will be taken back to your hotel. Topkapi Palace is closed on Tuesdays, it is replaced with Beylerbeyi Palace (on the Asian side of the city). Istanbul is the largest city in Turkey, constituting the country's economic, cultural, and historical heart. Population ois 13.5 million, the city forms one of the largest urban agglomerations in Europe and is among the largest cities in the world by population within city limits.Istanbul's vast area of 5,343 square kilometers (2,063 sq mi) is coterminous with Istanbul Province, of which the city is the administrative capital. 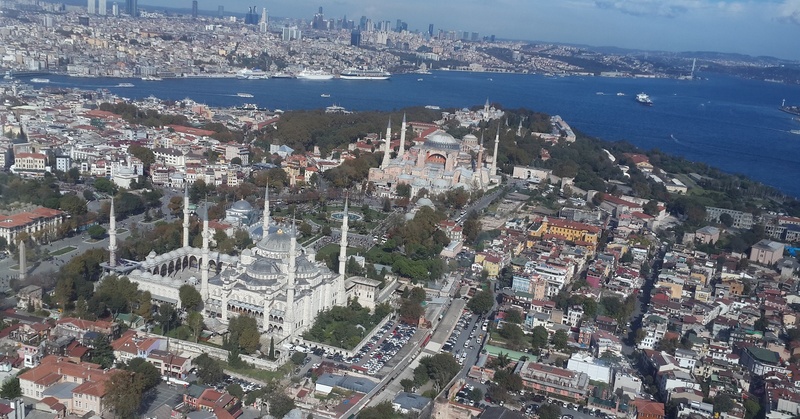 Istanbul is a transcontinental city, straddling the Bosphorus—one of the world's busiest waterways—in northwestern Turkey, between the Sea of Marmara and the Black Sea. Its commercial and historical center lies in Europe, while a third of its population lives in Asia.